You could easily get such a bike going again, with a bit of scraping and a few drops of oil. I’d say it’s seized up pretty badly by now, though. It belonged to the old man across the road, and can’t have been ridden for a long time. I suppose that the old man would be Ned. Yes. Most people called him Neddy, but we always called him Ned. Thank you for that, Cymbeline. John Mackie has asked me to pass on his best wishes to you. Very kind of Mr Mackie. Thank you for passing on the message, Brendano. This may entice John to come and talk to us. He was always a big fan of yours, as you know. If not, there’s a link to his blog on the right on my homepage. I am sure that I would be able to root out a low-cut blouse and a bottle of Penderyn whisky in order to entice Mr Mackie to these shores. I suspect that the Penderyn would interest him. I may, of course, be wrong. John’s favourite phrase, as I recall. I think it was your erudition that chiefly interested him, but I may of course be wrong too. Actually, I was wondering what Mr Mackie might think of upstart Welsh whisky. I believe that Penderyn has won several prizes. Recently in a rather posh, hushed French booze shop, I heard a salesman recommending Penderyn to a rich client. I had never heard of it before. Hello PapaG … yes, those old bikes were solid and heavy, with no gears, but many people rode them very long distances as they went about their business. 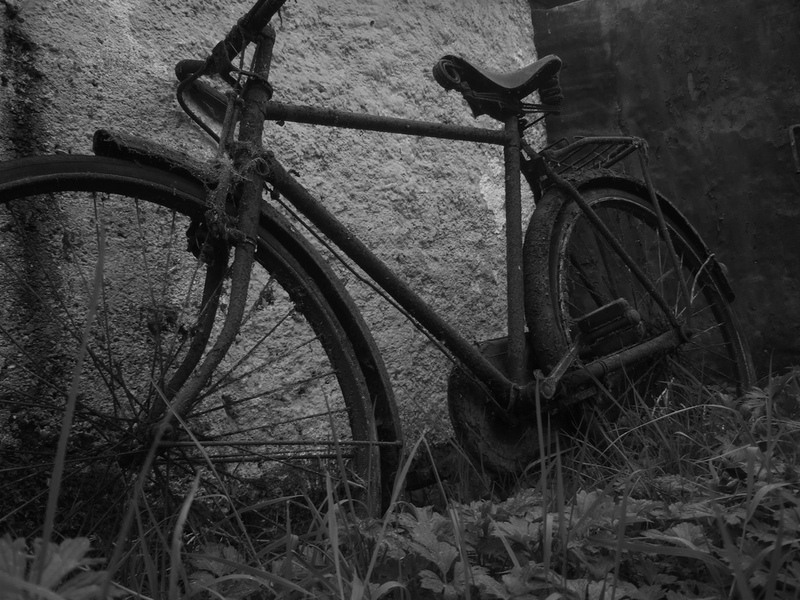 Yes, Papaguinea is right about how the bicycle looks as though it were made from lead pipes. Excellent description. This is why it is an excellent photograph too – Sean certainly had an instinctive eye for the essential qualities of an object. He saw water well too, and reflections. Great talent. I think that my favourite photograph is the one playing with the reflections as he looks through the glass into Clio’s room. Brilliant.